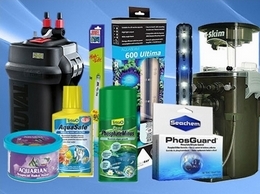 Complete Aquatics supply a wide range of aquariums and fish-keeping products including marine aquariums, tropical aquariums, aquarium cabinets, pumps, filters and lighting. They also supply aquarium heaters and cleaning equipment too. Ocean Life Aquatics provide the design, manufacture and installation of bespoke fish tanks and aquariums across the North West. Resource for pond plant and water lily. Find a large selection of aquatic plants for aquarium, pond plant and water lily from Thailand.